Surely I have written about this before. I am thinking about the word “discernment.” I just had the luck to spend a week between the worlds with some amazing hags and edgeriders. As part of this week, I gathered around a kitchen table with folks who wanted to explore hag magic or kitchen table wisdom. We shared our tools, sought insight, and we gossiped about the choice between saying something and keeping quiet. We learned that a hag knows when to jump in with an opinion or healing potion and when to remain silent and see what happens next. This is discernment born of experience. The hard truth is that most of that experience comes from making mistakes. It feels uncomfortable to develop wisdom this way. I know I would really like to bypass the mistakes part. But that doesn’t seem to be the way of discernment. The Online Etymology Dictionary says the root of the word discern comes from words meaning to sieve, sift, and sort. It goes further to say that the word crisis is related to this etymology. A crisis once meant a turning point in a disease, a judgment or decision, and that judgment came from distinguishing, sifting, and sorting what should be done. It seems to me that if there is an emergency remedy we need right now in our current states of crisis, it is discernment—to know what we know and when to act. Fortunately for us, Virgo takes center stage this week and this sign knows a lot about sifting and sorting. The Full Moon in Virgo illuminates the polarity between Piscean dreams and Virgoan pragmatism. Jupiter, the guru of the solar system, is preaching the gospel of Virgo all over the place right now. We have the opportunity to become wiser. This week’s transits are especially attuned to the development of discernment and since making mistakes is part of that development, well then, that will happen too. An intriguing Yod aspect pattern sets off Jupiter in Virgo this week. A Yod looks like an isosceles triangle. It is comprised of two quincunx (150 degrees) aspects pointing to one planet and one sextile (60 degrees) aspect between the two “bottom” planets. Yod means finger of God, which gives us a hint about how this pattern feels—important and scrutinized. The sextile aspect encourages and creates potential. We hope to use this energy well. The quincunx aspect is such a strange connection (with a strange name) that I think of it as the paradox aspect. This aspect makes it is hard to reconcile differences, and so we just have to learn to live with them. One part of the Yod represents potential and the other represents surrender. What a great set up for discernment! Jupiter in Virgo is at the apex of the Yod. Can we get what the guru is telling us? Pragmatic, holistic, humble, and discerning, Virgo insists we be thoughtful. The other planets involved in this pattern, which will be felt from February 26 through March 5, begins as a sextile between Mercury in Aquarius and Uranus in Aries and then switches to a sextile between Venus in Aquarius and Uranus in Aries. Mercury and Uranus are brimming with ideas and a zeal for change. Venus and Uranus carry this zeal into our art, our relationships, and our connections with others. If you are an Aquarian type of person, this is so much happy. If you are a Virgoan type, then it might feel stressful trying to rein in horses that went to gallop full throttle. Somewhere in between is discernment. Imagine you are sitting at a kitchen table with a bunch of hags. What are they telling you about your own desires and choices around change and well-being? If you could ask a hag for advice, what would you ask? If you could apply your wisdom to one revolutionary act, what would that act be? Don’t forget, mistakes make us wiser. 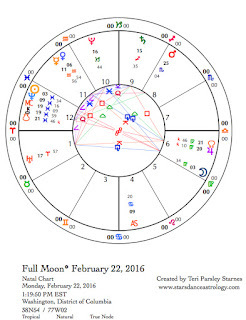 February 22—Full Moon: Illuminating. This lunar cycle began in Aquarius and culminates in the polarity of Pisces and Virgo. The Aquarian seed time of the New Moon was a chance to plant intention around the ideas of edges and centers. Aquarius pushes the edges of groups and structures, asking what is possible, what can we change? Have you done work around your own edges? What I have noticed is that any push toward the edge also pulls me back to the center. This pulsation is part of growing awareness. Rather than be attached to one place or another, both the center and the edge are vital places to inhabit. The work of this week and today’s Full Moon in Virgo is to develop discernment about where we need to be at any moment. The Virgo Moon opposes the Pisces Sun. This polarity is about the edges and centers of our desires and obligations. Pisces water encourages dissolving of hard edges. Virgo earth encourages useful structures to channel the Piscean flow. Oppositions are the illuminating feature of any Full Moon. Oppositions help us notice extremes and find ways to balance them through integration. We are being invited to build more capacity for emotion with earthy common sense. The rest of the lunar cycle is not a time to ignore our feelings. Big, oceanic emotions are coming to the surface. The opposition between Jupiter in Virgo and Chiron in Pisces alongside the Nodes of the Moon, tells us to pay attention and be gentle with ourselves. Chiron has been transiting through Pisces since 2010. It leaves this sign in 2018. Chiron is an initiator offering the Piscean gifts of empathy and compassion. Much of this experience has been to feel more and recognize shared trauma. This moment when Jupiter opposes Chiron is an opportunity to learn how to integrate discernment and self-care into the softening Pisces experience. The opposition between Chiron and Jupiter is widely square to Saturn in Sagittarius, providing more pressure on ourselves to get these lessons right. How ironic that we can feel pressure to get better at self-care and compassion, but then humans are infinitely amusing aren’t we? Saturn reminds us that we have important work to do individually and collectively. This moment illuminates the dreams of this lunar cycle. Tuesday, February, 23. If your heart cracks open today, try to breathe past the desire to fix things. This opening is important. Chiron in Pisces opposes Jupiter and the Moon in Virgo. By making a square to Saturn in Sagittarius later in the day, the Moon draws together this sensation that if we can stand the vulnerability, we can also begin to master discernment and self-care too. It is critical to avoid self-shaming under this influence. It may be a day to practice loving yourself beyond all reason. Pluto in Capricorn helps by adding strong, powerful grounding to the day. Wednesday, February 24. Are you doing your work of discerning when to act and when to wait? Have you improved your ability to hold emotional honesty? Have you exercised the skill of drawing boundaries? Saying no? Congratulations. This feels like a productive day. Enjoy. Thursday, February 25. Commitment to justice and fairness in communication is strong today. Every vision needs a plan for following up. How do we implement our brilliant ideas? Mercury in Aquarius inspires the desire to break down the barriers. A sextile between Mercury and Saturn in Sagittarius provides just enough grounded support to formulate those plans. We desire to elevate our efforts to benefit the collective. The Libra Moon asks for balance and equity, and beauty. May our solutions be elegant. February 26—Disseminating Moon: Sharing. To recap, this lunar cycle began in Aquarian seed time and has transitioned into the Pisces season. The Pisces New Moon will follow the completion of the current lunar cycle. There have been so many influences on our desires to bring change and vision to the world—a core Aquarian initiative! I set an intention at the beginning of this cycle to learn more about my edges and centers. I’ve experienced peak moments in both places. Under the Pisces influences of the cycle, I’ve deepened (as water encourages us to do) into paradox and shared experiences of exclusion, marginalization, and the trauma of isolation (even when it is shared!). At this phase, we begin to harvest the wisdom of the experiences of the lunar cycle. And we share it. In the introduction to this week’s forecast, I wrote about a Yod aspect pattern that influences the next few days. There is great eagerness to jump into change, to flip into the headspace of abstraction, and lose track of the felt experiences of this lunar cycle. Those embodied moments are asking us to see the bigger picture, remember the values of pragmatism and self-care. Small structured steps are the Virgo way forward and the Yod to Jupiter in Virgo (with Uranus in Aries and Mercury in Aquarius forming the sextile base) is forcing the issue. We must make choices. We will make mistakes. Discernment is the harvest. The Moon in Libra, for the most part, encourages compromise and collaboration. Balance is a virtue. However, the square between the Moon and Pluto in Capricorn early in the day (CST) creates an edge. We are more intolerant of power abuses. This may fuel the need to be discerning about our choices. The Moon also opposes Uranus. It will be difficult to be as patient as we’d like to be. Saturday, February 27. The quincunx aspect between Mercury in Aquarius and Jupiter in Virgo brings up the need to surrender a fixed point of view. Conflicts may arise around values and methods. The pressure to be perfect could be strong. The gift of this paradox-filled day is more capacity to see diverse perspectives. With the waning Moon in Scorpio, the desire to be alone or with those we most trust is strong. We are sorting and sifting information. Sunday, February 28. Once a year, the Sun conjoins with Neptune. Today, the illuminating, conscious influence of the Sun blends with the transpersonal, diffuse influence of Neptune. Sometimes, it feels like these two forces are antithetic to each other. The Sun encourages our sense of self and identity and purpose. Neptune dissolves those things into transcendence. Rather than experience these things as opposite, we get a sense of how our conscious purpose can merge with something outside our own ego structures. This may not be a simple task, however. The Moon in Scorpio makes squares to Venus and Mercury in Aquarius. Fixed ideas and emotions need to be dealt with too. [This week's forecast is for two weeks.] A new lunar cycle begins February 8. This one takes its seed potential from Aquarius, a sign that knows about both the center of community and the edges of possibility. Right now, I’m curious about edges and centers. I am interested in understanding their partnership, their tension. This tension is like an engine that drives the evolutionary bus. Aquarius is the driver. “The only constant is change,” is an Aquarian truism. This sign is dedicated to the edgy mission of revolution, pushing against the status quo, claiming radical difference. But not entirely. Aquarius also has an interest in the center as community and collective action help manifest the changes they envision. The community is what the desire to change is about. Thus, as a fixed sign, Aquarius is concerned with anchoring the center yet pushing the edges. The dynamic tension inherent in this sign is influenced by the signs preceding and following it. The preceding sign, Capricorn, maintains form through monitoring the status quo. It defines the values of form and cohesion. Pisces dissolves form through transcendent experiences of release and expansion. Standing between form and formlessness, Aquarius is the midwife helping us through the portal from the known to the unknown. This is an edge held by the center. I’ve noticed that Aquarians have a love/hate relationship to community. Loving the edges but not so sure about the centers, community can begin to feel confining and conforming. On the other hand, as an edge dweller, Aquarius can feel isolated and estranged from the center, craving the embrace of community. Seesawing back and forth between the extremes of this polarity, the mission is to be aware of which point of view we are choosing and why. Both the center and the edge hold vital places for us, I think. There is power in both, especially when we acknowledge our own assumptions and stories and wounds around inclusion and exclusion. This lunar cycle begins in Aquarius. That’s the seed. However, when the Sun enters Pisces on February 18, followed by the Full Moon in the signs of Pisces/Virgo on February 22, the Aquarian seed is transformed by Pisces influence. This influence challenges ego structures. Whatever we think now about community, will change under this influence. I view each lunar cycle as a chance to hold intention and practice mindful awareness through the 8 phases of the lunar cycle. By the middle of the lunar cycle, the Aquarian intention will be observed through the Piscean lens. What I am noticing about the center and the edge will also change. Following the Moon teaches me to hold my truths lightly. The changing face of the Moon constantly reveals a new point of view. What do I believe right now about edges? What do I believe right now about the center? Aquarius as a fixed air sign, feels fairly certain about what it thinks. That confidence is both a gift and an illusion. For now, what are you certain about? How does certainty create a center that excludes the edge, and an edge that discounts the center? 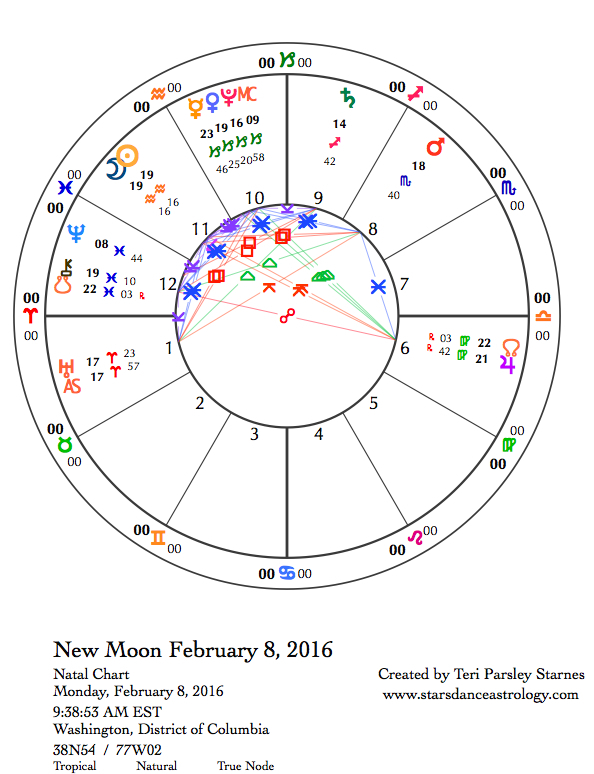 February 8—New Moon: Dreaming. Aquarius is planting a seed. Right now, we simply need to open, listen, and wonder what can grow from it. Opening, listening, and wondering are great ways to embrace an air sign influence on this lunar cycle. Aquarius is the fixed air sign. Fixity adds its own influence on the air energy of this lunar month. Aquarius is an anchor to the gifts of air. During the Aquarian season, we celebrate Imbolc, which is a holy day dedicated to dedication. Dedication begins with a thought, an inspiration, a spark of insight. Air is hard to hold onto, just like inspiration and insight can sometimes be hard to hold onto. We can create an anchor to that insight by dedicating ourselves to some manifestation of it. Think of this lunar cycle as an opportunity to dedicate yourself to a dream. I know I will be exploring edges and centers this cycle. Aquarius has a way of pushing edges and then, coming back to the center of community. The edginess of this cycle begins with a square between Mars in Scorpio and the Sun and Moon in Aquarius. I think of the contrast beween Aquarius and Scorpio as the archetypal tension between darkness and light. Neither is better than the other. Neither can exist without the other, yet we often feel the conflict between them as ultimate battles. This influence may provoke some battles and gives us a sense that this lunar cycle is important. We want to pay attention. Mars doesn’t let us coast through it. The separating conjunction between Venus and Pluto in Capricorn influences this cycle as well. This is another indication that we feel the shadows surrounding our inspirations. Things are not perfect. Shadow work includes looking at our own stuff. Venus says that there is beauty under the emotions we may fear. Honor that beauty. Tuesday, February, 9. The Moon entering Pisces invites us to exhale. Be where you are. 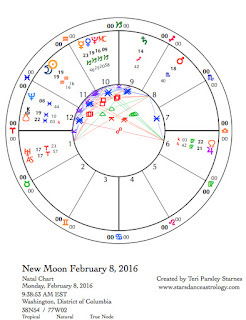 The Moon conjoins Neptune in Pisces, and Mars in Scorpio is trine Chiron in Pisces. All this Pisces influence asks us to surrender. Perhaps we need to acknowledge the stress we’ve been carrying, perhaps we need to pay more attention to our vulnerable hearts. Perhaps we need to believe what our intuitions have been telling us for a while. Listen, open, and invite a greater connection to others. This lays a good foundation for the brand new lunar cycle. Wednesday, February 10. The trine between Venus in Capricorn and Jupiter in Virgo creates an expansive and hopeful energy, especially around earthy things. Capricorn and Virgo are both earth signs. Venus and Jupiter are the benefics of the solar system. Blessings are abundant if we engage with the energy rather than let it distract us into complacency. That is the nature of a trine. We can take them for granted. The earth is speaking. We can listen for wisdom and for ways we can be more responsible. Jupiter in Virgo has been inviting us to develop the Virgo gift of discernment. It feels good to engage in our whole bodies and minds to use this gift well. The Sun makes a challenging aspect to Jupiter. It is important to pay attention right now to Virgo themes. With the Moon in Pisces opposing Jupiter today, we have a chance to remember that perfectionism is not the answer. February 11— Crescent Moon: Beginning. The Aries Moon lifts our energy levels considerably and that fits in well with this phase of the Moon. The seeds of this Aquarius cycle begin to tremble and awaken. What inspires you? Embrace that inspiration with acts of devotion and manifestation. There is a fire in our bellies. For this Aquarian cycle I set an intention to work with my edges and my relationship to the center. Even though I don’t know where it will lead, I leap into inclusion of the excluded parts of myself. At the same time, can I stand on the edge of this unknown and be fully present? Aries energy can be courageous and foolish at the same time. Be willing to be willing. Friday, February 12. The Moon is busy burning a path through this day. In Aries, the Moon first activates a productive and energetic morning with a trine to Saturn in Sagittarius. You might find yourself initiating action that will yield results and growth. Keep the faith, as tension and conflict could also arise. This may happen in the greater arena of world events as the Moon makes a square to Pluto and Venus in Capricorn and conjoins Uranus also. For the last few years, the Pluto/Uranus square has symbolized an awakening to the need for deep and profound change. We must respond. The Aries Moon could create impulsive reactions to things we deem unjust or plain wrong. However, fire can burn away complacency and confusion. How do you discern the just and right action? Saturday, February 13. 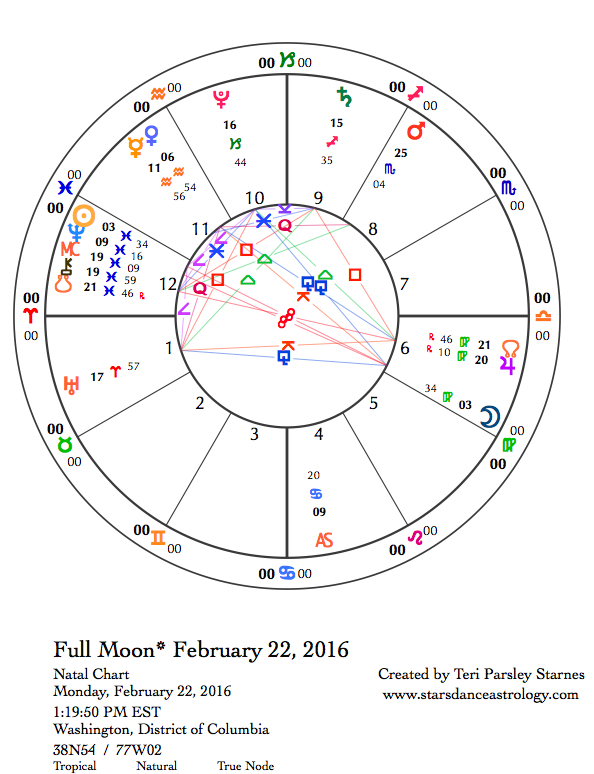 Yesterday’s fiery energy finds solid grounding with the Moon’s entry into Taurus. It could feel like someone is putting on the brakes, and that is good. Take time to let the lessons of the past few days sink in. If you are noticing the relationship between the edge and center, then take time to listen to what your body knows about the dynamic tension between what we accept and reject about ourselves. The encouraging sextile between Mars in Scorpio and Jupiter in Virgo helps us know what we know. Trust your instincts, especially those that give a sense of wholeness, whatever that means to you. Mercury re-enters Aquarius where it was at the beginning of the recent retrograde period. The Capricorn lessons about intention and form provide a foundation for our imaginations. February 14—First Quarter Moon: Manifesting. A grand earth trine of the Moon in Taurus, Jupiter in Virgo, and Pluto in Capricorn both supports and challenges the growing intentions of this lunar cycle. Aquarius planted some seeds about inspiration and change. As an air sign, Aquarius can be big on ideas and not so great about follow through. Here come the earth signs to hold us accountable for our visions. What ingredient does earth supply to your lunar intentions this cycle? Do you need a steady practice? Realistic expectations? A plan? Time out for pleasure and wellness? The relationship between Taurus and Aquarius can be strained but also very helpful. The dynamic tension here invites us to accommodate a broad range of approaches—the concrete and the conceptual. Which is your edge? How does this help you manifest intention? Monday, February 15. The Moon’s entry into Gemini stirs up verbal processing. The trine between the Moon and Mercury only increases the need to communicate. Again, we notice the influence of air on the Aquarian themes for this lunar cycle. Even if you aren’t the community type, you might find yourself gravitating towards a group that both inspires and offers you a chance to change the world. Optimism is high. Tuesday, February, 16. The Moon in Gemini activates unsettled energy. A mutable grand cross (not exact, but close) forms in the afternoon with Jupiter in Virgo, Chiron in Pisces, Saturn in Sagittarius, and the Moon in Gemini making up the intersecting axes of this cross. Mutable signs are after information, taking it in via the element associated with it. Chiron in Pisces feels everything. Emotions are large. Jupiter in Virgo processes everything. Details are overwhelming. Saturn in Sagittarius expounds on everything. Fanaticism is strong. The Moon in Gemini wants to experience everything. Distractions are everywhere. All these possible challenges also contain gifts. Compassion, service, curiosity, and connection are inherent in these signs too. What helps you reframe your point of view? Venus enters Aquarius for the next three weeks. Chance encounters from out of the blue can help us stay connected to intention this lunar cycle. Look for support from diverse and unexpected places. Wednesday, February 17. We welcome a place to land. The airy mutable emphasis of the last couple of days may leave you overwhelmed, especially if you are an introvert. The Cancer Moon says, make a pot of soup and take a long bath while you think over the things you have learned and the things you have still left to do. This pause in the lunar cycle is only temporary, but much needed. February 18—Gibbous Moon: Perfecting. Sun enters Pisces. A seed was planted by Aquarius at the New Moon on February 8. This seed has trembled, pushed out roots, emerged from the ground, and is beginning to flower. What have you noticed about the relationship between inspiration and dedication, the edges and the centers? What is flowering in you? This phase of the Moon reveals the contrast between the seed and the budding flower. Aquarius seed time is very conceptual. We can get lost in our heads, yet at the same time not really care because the sky holds wonders. Air helps us begin, but has a hard time bringing completion. It is useful to engage all the elements in our projects. With the Sun’s ingress into Pisces and the Moon in Cancer (both water signs), the teacher becomes our emotions. With the revolutionary zeal of Aquarius still resonant in this lunar cycle, we also tune into the revolution of self-acceptance. Water helps to dissolve false barriers. The exploration of edges and centers takes on a new tone when we see the illusion of false polarities and dichotomies. This can be even more revolutionary. The Moon opposes Pluto in Capricorn and makes a square to Uranus in Aries. This contact reminds us that we need these revolutions to succeed. Sorrow is not a distraction. Friday, February 19. Most of the day (CST), the Moon is in Cancer inviting us to remain in touch with our feelings. A grand water trine with Mars in Scorpio, Chiron in Pisces, and this sensitive Moon asks us to pay attention to the subsurface layers of emotion running through our hopes and dreams for the world. Venus and Mercury in Aquarius hold down the fort of Aquarian intention for this lunar cycle. We don’t have to split off between what we think and what we feel, although that is a temptation. Noticing our own paradoxical impulses helps us tolerate inconsistencies in others. Saturday, February 20. Aquarius and Leo need each other like a performer needs an audience. The Moon in Leo reminds us how innovative the Aquarian mission is when we celebrate individual creativity. The Moon in Leo sparks a desire to shine through our own creative gifts, whatever they are. The performer is fed by the audience, but it doesn’t just go one way. The audience is fed by the performer too. The Moon opposes Venus and Mercury in Aquarius. We get a chance to notice this healthy exchange today. If we aren’t generous with our gifts and generously appreciate others, we all suffer just a little bit. Sunday, February 21. The elemental layers of this lunar cycle continue to develop. From air to earth, to water, to fire, we are feeding the seed planted at the New Moon on February 8 in the sign of Aquarius (fixed air). Concepts were informed by emotions. Now, we are encouraged by fire to energetically sustain our Aquarian dreams and ideals with action, creativity, and passion. There is a grand fire trine in force today. The Moon in Leo, Saturn in Sagittarius, and Uranus in Aries encourage self-expression and self-awareness. The square between Mars in Scorpio and the Moon in Leo helps us to not overlook the gifts of fire. We will have to earn them through self-honesty. If we don’t see our own foibles, someone else will be happy to point them out.